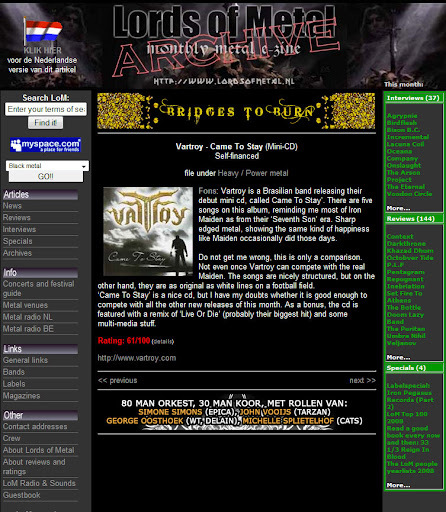 O site holandês Lords Of Metal publicou um bom review sobre o cd Came To Stay da banda VarTroY. Vartroy is a Brasilian band releasing their debut mini cd, called Came To Stay'. There are five songs on this album, reminding me most of Iron Maiden as from their 'Seventh Son' era. Sharp edged metal, showing the same kind of happiness like Maiden occasionally did those days. Do not get me wrong, this is only a comparison. Not even once Vartroy can compete with the real Maiden. The songs are nicely structured, but on the other hand, they are as original as white lines on a football field. 'Came To Stay' is a nice cd, but I have my doubts whether it is good enough to compete with all the other new releases of this month. As a bonus, the cd is featured with a remix of 'Live Or Die' (probably their biggest hit) and some multi-media stuff.